Discussion in 'Pacific Northwest' started by geargrrl, Jan 6, 2008. 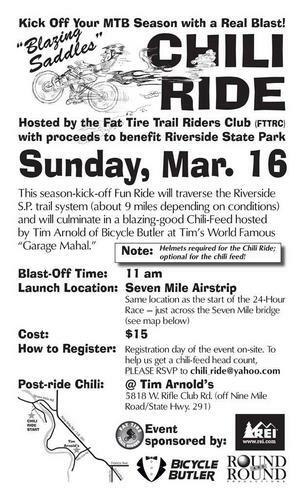 Cost is $15, all proceeds to benefit Riverside Park Foundation, a 501(c)3 non-profit. Please contact Chili_Ride@yahoo.com to RSVP, volunteer or other questions. New Date, March 16, same time place etc. www.fttrc.org will be updated with any new info.